You can use Microsoft Office 365 to create a collaboration with a Microsoft Word, Excel, or PowerPoint file. 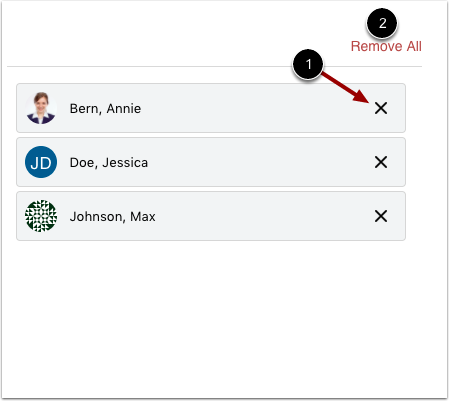 You can select individual users, groups, or both as part of a collaboration. To alert invitees about collaborations, you can create course events in the Calendar. If you cannot create a Microsoft collaboration, this feature has not been enabled for the course. Once you invite a user to a collaboration, the collaboration is available to the user in the user's Microsoft OneDrive. Uninviting the user or deleting the collaboration does not remove access to the collaboration once a user has been added. When creating a collaboration you cannot link to a previously created collaboration. Click the Add Collaboration button. 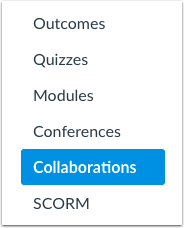 In the Type drop-down menu, select the type of collaboration you want to create. In the Document Name field , enter the name of your document. In the Description field , enter a description for the collaboration. The collaboration defaults to the People tab. If you want to collaborate with individual people in your course, click the name of a user you want to add to the collaboration . The user's name will move to the right side of the window . Add as many users as necessary. To remove a collaborator, click the Remove icon . To remove all users, click the Remove All link . You can also create collaborations with groups. To select an entire group, click the Groups tab . Select the group(s) you want to add to the collaboration . You can select individual users as well as a group in a collaboration. You can add multiple groups to a collaboration, but all groups will collaborate in the same document. For group-specific collaborations, consider creating a new collaboration for each group or creating a group collaboration from within the group. View your collaboration. To edit the collaboration, click the Edit icon . To delete the collaboration, click the Delete icon . Previous Topic:How do I create a Google Docs collaboration as an instructor? Next Topic:How do I delete a collaboration as an instructor? Table of Contents > Collaborations > How do I create a Microsoft Office 365 collaboration as an instructor?